Promedcare is committed to providing the highest quality Home Medical Equipment to its customers and improving their lives. Our goal is to be your one stop home medical equipment supplier. We have many types of home medical equipment in stock to meet our customer’s needs. If we don’t, we can special order any piece of equipment, if necessary. Promedcare provides the best equipment available in the industry making the patient’s need our top priority. We invest in the best technology available from all manufacturers to ensure the patient’s independence and quality of life are what motivates us first and foremost. We are committed to providing quality respiratory service by working directly with our patients and coordinating customers’ needs with their insurance provider. The Invacare HomeFill II complete home oxygen system will revolutionize ambulatory oxygen by allowing patients to fill their own high-pressure cylinders from a concentrator. The HomeFill is a multi-stage pump that simply and safely compresses oxygen from a specially equipped Invacare 5-liter or 10-liter concentrator into oxygen cylinders in size M2, ML4, ML6 and M9(c). 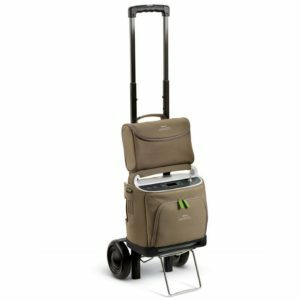 We have two portable oxygen concentrators available to rent on a weekly basis. Our patients find it very user-friendly and simply to operate when traveling for vacations or for family gatherings out of town. They can be switched from continuous or pulsing and are DC adaptable for easy car charging.